Trucks awaiting entry to one of Port Botany’s container yards. ABC photo. Peak body Road Freight NSW (RFNSW) says it is unfair that truck operators already reeling from mounting port access fees have now been slugged with new charges for pick-ups and drop-offs at Sydney container parks. From February 1, if a truck arrives at DP World Logistics more than 60 minutes prior to the start of the nominated ‘Notification Window’, the carrier will be forced to pay an ‘Off Window Surcharge’ of $25.50 per booking. If a truck arrives more than 60 minutes after the end of the nominated slot, the carrier will also incur the same $25.50 ‘Off Window Surcharge’. If a truck arrives within its ‘Notification Window’, the charge will be $16.50. 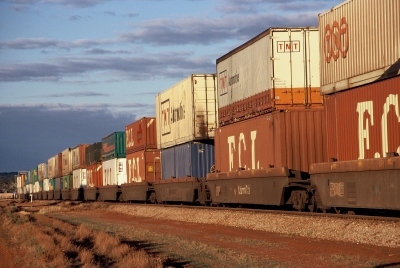 RFNSW chief executive Simon O’Hara said its members are asking why the new surcharges are being imposed on carriers given that the operation of empty container parks appear to be “inefficient, unproductive and haphazard”. “It’s a new year and another new surcharge for truck operators,” Mr O’Hara said. “Our members are angry and frustrated they’ve been hit with further fees which are making their daily operations unsustainable. “Notification windows for truck arrivals aren’t always available at short notice and it’s unfair that the length of time drivers may sit waiting in the rank waiting to be processed isn’t taken in to account when these surcharges are being applied. “That’s why our members believe the penalties are unwarranted and yet another cost impost, on top of the new DP World infrastructure fee of $63.80 per container at the Port Botany terminal, which came in to effect on January 1. Mr O’Hara said RFNSW will be meeting with DP World Logistics today in order to raise its concerns on behalf of its members.